1.2 Why do I need to prepare for Crowdfunding now ? 1.3 Why do I need to plan my Crowdfunding now? 1.4 What happens if I try and fail in my first Crowdfunding campaign ? 1.5 Why we are asked to get a Google Apps Premium account ? 1.6 CrowdFundingPlanning process assisting Entrepreneurs, SMBs and start ups ? “If opportunity doesn't knock, build a door”. Like you, we had and have many good ideas and needed to know are they practical ($) or useful for humanity? We also made it to be "Wiki" style since we believe on expert sourcing and the power of the "crowd" using internet network (or " the cloud"). We believe "open systems " crowdsourcing and cloud-sourcing will allow innovations to get to a higher level and to reality. We invite you to join our membership and collaborate with us to add more relative updated content and collective of our experiences and knowledge to make Crowdfundingplanning.com to be the "door" that opens up and leads SMBs, Entrepreneurs and Startups to success and prosperity. Why do I need to prepare for Crowdfunding now ? When we look at successful individuals, or companies that achieve market share beyond their initial dreams and plans, you can quickly see that Timing is Everything. This is even more true about CrowdFunding. CrowdFunding is an avenue for entrepreneurs, startups and SMBs to solicit Working Capital from non-accredited investors. The CrowdFunding provisions of the JOBS Act (H.R. 3606 Jump Start Our Business Startups Act) allows companies to raise up to $1 million in capital per year via crowdfunding platforms from individual investors without the requirements to registering with the SEC (Securities and Exchange Commission ). Many investors will come from, family, friends ,Venture capitalistss, Entrepreneurs’ preexisting networks, mentors, andf former colleagues. Clearly, There are many unknowns as the SEC completes the development of the functional details and related regulations of CrowdFunding Platforms by January 2013. Build and develop your business concept and your " business plan "
Start building the "Crowd" as early as possible for your "crowd" funding campaign. As you see Crowd comes first before funding. Protect your idea while your project is posted in Crowdfunding campaign for all the world to see One answer might be “File a provisional patent application" as soon as possible. Why do I need to plan my Crowdfunding now? As an entrepreneur, startup and SMB, you have a specific goal. and " A CROWDFUNDING WITHOUT PLAN IS JUST A WISH ". What happens if I try and fail in my first Crowdfunding campaign ? Learn how to "Crowdsource" resource needed to develop your idea cost efficiently. Access to network of professional services experts. Access to network of professional CF consultants. Get ideas for future projects. Learn Google apps and build your own virtual office in the cloud. Learn how to leverage with Google business solutions (new paradigm, competitive advantage). Learn business intelligence, data mining and competition analysis. Learn web and content development. Learn SEO, SEM and SMM. Learn social media campaign building and leveraging your networks. Learn how to make use of your affinity networks. Learn how to receive free marketing and free press. Learn how to get valuable Feedback. Learn how to gain street credibility. Why we are asked to get a Google Apps Premium account ? 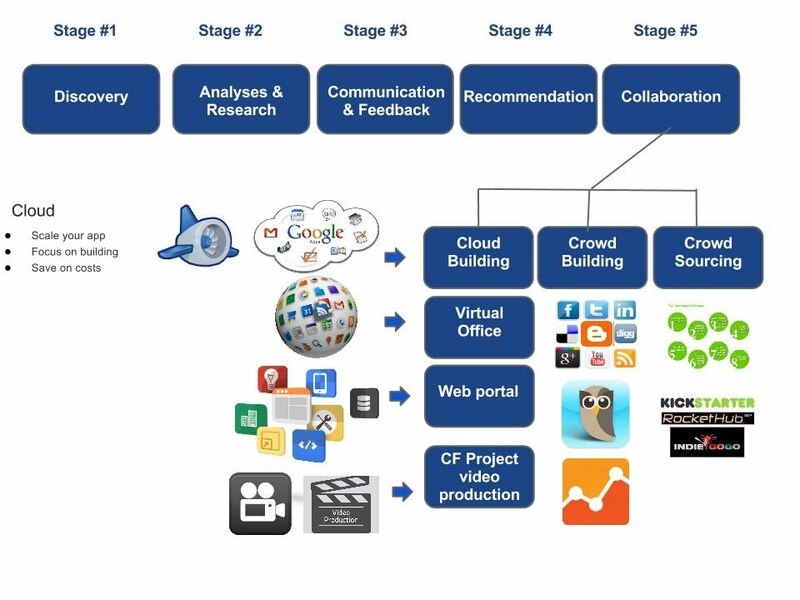 In order to be successful in Crowdfunding planning, campaign, and managing the business, you need a powerful Information technology engine. Google is the engine of innovation and you be able to leverage every accepts of your business and Crowdfunding campaign with Google Apps and Google business solutions. You will get the same technology platform Google uses to manage its daily business . Google Apps is a solid foundation for your ideas and your business. Each user gets 25 GB of email and IM storage (50 times the industry average). Powerful Gmail spam filtering helps you stay focused on what's important. Postini filtering lets you customize your spam protection. Google Reader: Brand and competition monitoring, lead generation. Reduce cost of marketing research and new brand, service and product development. Google News: Boost marketing and advertising and press releases. Google Places: Boost local product and services marketing. Google Apps / cloud computing: Reducing office IT expense more than 75% ( no back up , no software purchases, no server, no service / maintenance device contract) , Improve documents sharing and collaborations. Google Apps (email, Calendar and contacts): Improve mobility and reduce operations expense. Google Apps (Video): Reduce cost of training and improve communications and marketing. Google Apps (market place): Reduce cost (time and staff) related to project management, accounting, marketing, and sales. Increase operations and project deployment velocity, improve quality to seamless communications. Google Apps (sites): Reduce market cost by developing ease to use websites and lead catcher tools. Google Web Master: Reduce cost of Search engine optimization and web site performanceGoogle Voice: Reduce direct CKT and long distance call monthly expense. Google Search (Customized): Reduce cost of business intelligence research and new products and services development in short amount of time . CrowdFundingPlanning process assisting Entrepreneurs, SMBs and start ups ? Using Information gathered in the discovery phase, we analyze and research the overall concept and each of the main categories outline in the Concept definition. This phase involves building on the data from the Discovery phase, bringing to bear practices, Crowd building methodologies, standards Into a reference frameworks and best practices. We solicit your input after completing our detail analysis and research to make sure we are aligned with your vision, mission and goal . Recommendations are then made on each of the identified applicable items in detail. This includes the breakthrough road map and results analysis of your current “Crowd Assets”. We look at the competition, market needs and trends and project if the direction of the new product , service and business is strategic and financially viable . We create a plan and schedule based on PMP method and we measure success every step in our mutually agreed plan . We work with entrepreneur and start up and provide them with fortune 500 Information technology infrastructure, Crowd and relationship building engines , Business process outsourcing and business process CrowdSourcing to reduce cost and focus on raising the seed funding needed . From ideation to revenue, we have the team and the tool to get you to the next level! The number of pledges, donation and arwad that you receive is entirely dependent on how well you pitch and deliver your story and concept. Though you may have a great idea, if it is not presented the best way well, it will not make an impression and build the trust you need on the audience. Main goal is produce a very compelling and engaging video ( and not enough budget may be an slideshow) to appeal to the broadest to largest spectrum of crowd possible. Your answers will likely point to type of video you need to produce. You see why the word “crowd” comes first in CrowdFunding. Crowd wants to know you ,your product, service, your perks and also above all, they want to trust you . You know by now how important video is to increasing conversion in online sales, but the exact same is true of crowdfunding. According to Kickstarter, “projects with videos succeed at a much higher rate than those without (50% vs. 30%). Crowdfunding pitches with video content raise 112% more than pitches without videos. Those videos are interesting and some even amazing – and a big part of why their campaigns were successful – but your video can be as simple as you sitting in front of a web camera and telling your story. On the other hand, some campaigns call for a professionally produced video. Pebble’s video and Jumpshot clearly has extremely high production values, but don’t let that intimidate you. What makes their video effective isn’t only the quality of its production; it’s the quality of its message that really matters. Choosing a camera is the first step on your way to making videos that you can share on Vimeo. There are a lot of options to choose from including camcorders, simple point and shoot cameras, and nowadays cellphones with built in video cameras. Where do you even start? Check out the video below for a quick run down of your various movie making options. Editing video clips together can be really fun, especially once you master a few basic features in your editing program. With a bit of patience and experimentation you'll be producing smoothly edited videos in no time. For an overview of what you can do in a standard editing program watch the video below. It's very important that you keep an aspect ratio of 4:3 or 16:9, otherwise the quality of your video will be degraded. Flash 7 codec performs best when the frame width and height use multiples of 16. This is optimal for video playback. Who is our Crowd and how to build our crowd to maximize our crowd Funding ? Your virtual crowd, this include people you contact with or people that contact you via Internet .This include social Media , web site forms, blogs, email ...etc. We call this your virtual crowd that usually participate , donate or invest to most of the funds. Create Buzz: Make sure you get alerted when writers need a source like you for their news stories, helping you generate publicity and buzz for your business. Grow Fans: Get help from CrowdFunding Planning to make sure you stand out on Facebook, increase your fans, generate interest with offers and products, and turn fans into customers..
Track Results: You should be able to see your success and track your increasing fans, followers and visitors and instantly see what's working and how to do even better. Use it Anywhere: Grow your CrowdFunding while before , during and even after your campaign is ended .